I was recently invited over to Victoria Street Richmond to check out the latest addition to the ever increasing array of Thai restaurants that populate the previously Vietnamese dominated strip. 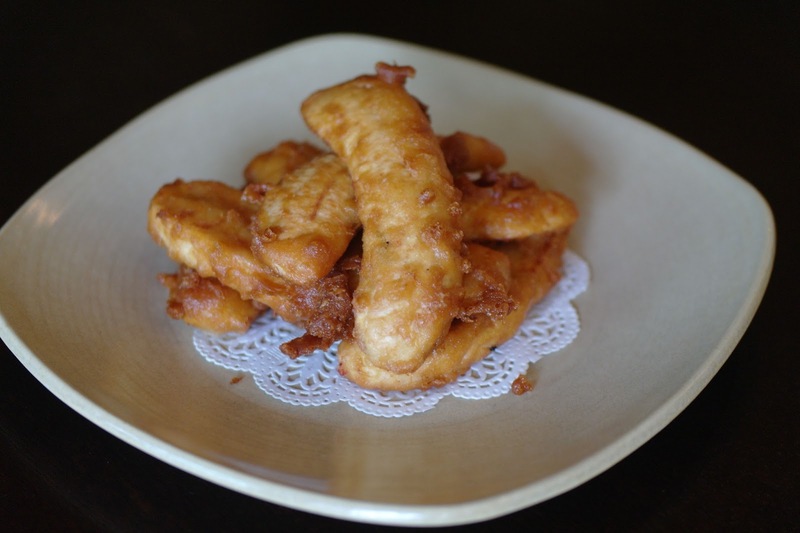 With its modern interior design and comprehensive menu of authentic Thai classics ZabVers is a certainly a most welcome addition to the area. 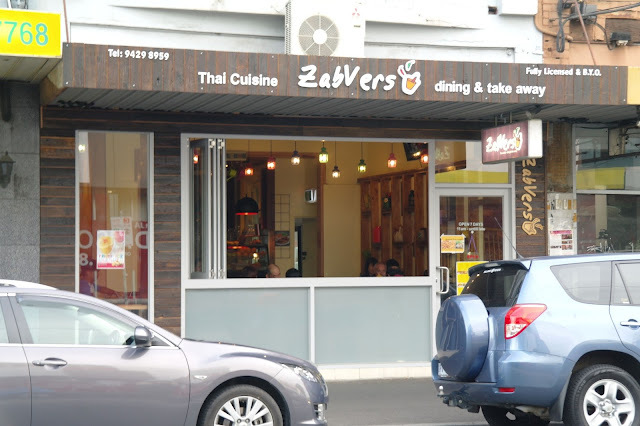 The name ZabVers is an interesting one which essentially is Thai slang for super delicious. 'Zab' is an Issan word for delicious and the addition of 'Vers' is a sort of young persons' slang for extra or super. What's interesting is that 'Vers' is actually a shortening of the English word 'Over' and is used as a suffix to enhance the importance of the word that precedes it. I quite like the way the Thai sometimes use shortened English words in a colloquial kind of slang. It's a bit of an insight into how western minded the young Thai are these days. 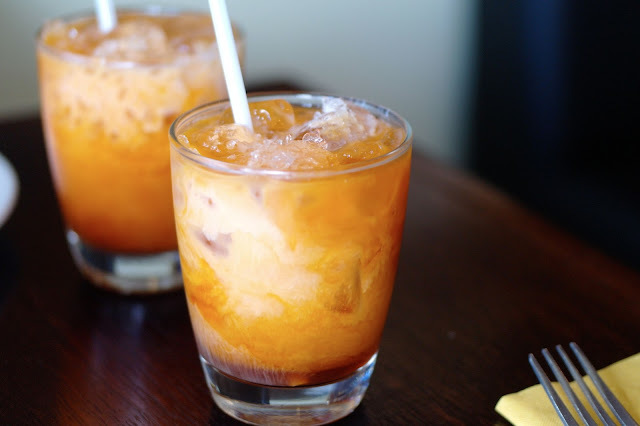 It was a pretty warm evening so I was delighted to be brought a glass of my favourite Thai drink, Cha Yen which is Thai milk tea sweetened with both evaporated and condensed milk. It's super sweet but also very refreshingly cooling on a hot day. The next dish, Khao Soy is one you don't often see so course I was automatically impressed. 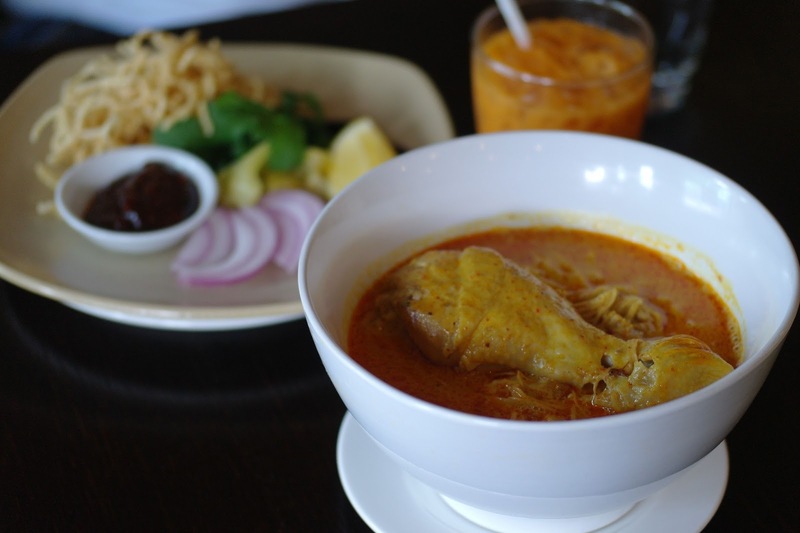 Khao Soy is a Chang Mai specialty of chicken in a creamy mild coconut curry. It is served with crispy egg noodles, raw vegetables and nam prik pow as accompaniments. With its mild heat levels I could see this dish becoming quite popular with those 'Aussie' customers who often struggle with the spicyness of many Thai dishes. ZabVers specialises in Isan and Northern Thai regional dishes so it's only natural that they offered their version of Tom Zap for me to try. The delicately thin but spicy broth was actually perfect to reset my palate after the cream curry. A disarmingly complex dish, Tom Zap is predominantly flavoured by galangal and lemongrass however the Thai basil adds a little kick of aniseed to complement the slightly bigger kick of chilli! 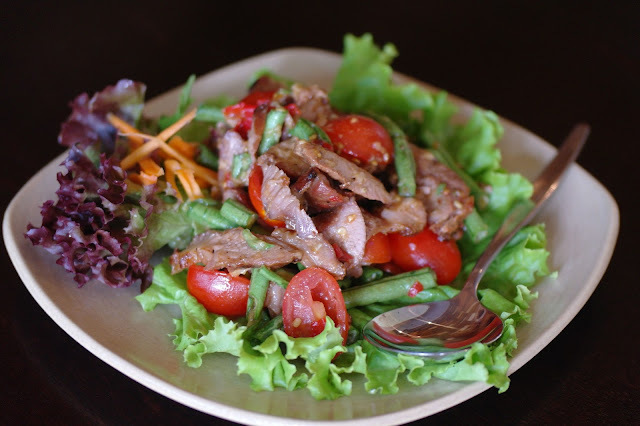 The array of Thai grilled meat salads seems to be almost never ending and I'm yet to find one that I don't absolutely love. This one was Moo Tok Krok which is bit like Som Tum without the papaya. Beautifully in its simplicity, the smoky grilled pork, acidic tomatoes, earthy snake beans and zesty lime chilli fish sauce dressing are a glorious combination. This is a dish I will certainly be making at home. 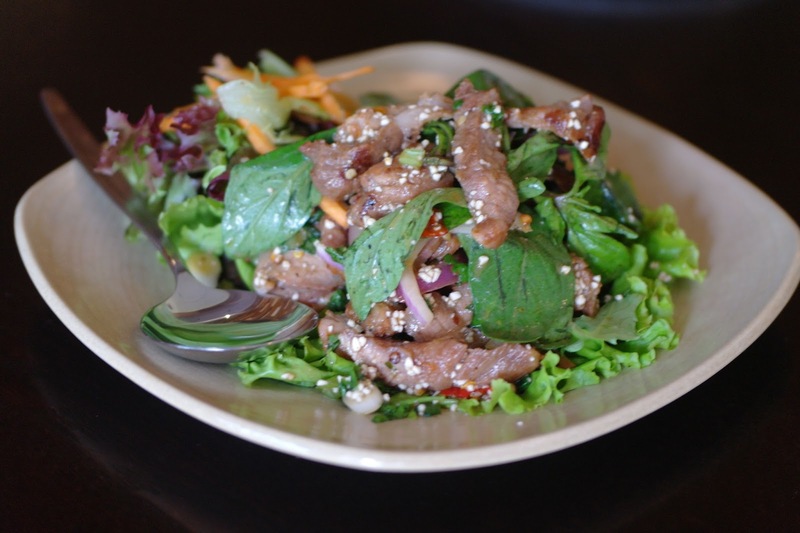 Nam Tok Moo is another delicious Thai grilled meat salad. Similar to Larp, this is another Northern Thai classic so that means it is very tasty but also very spicy. Ideally the pork would be grilled over charcoal to achieve the gorgeous smoky flavour however this is often difficult to achieve in a commercial kitchen (and at home). I really don't know whether the chef at ZabVers uses a charcoal grill but I certainly enjoyed the flavour of this grilled pork and the jim jaew dressing was a wonderfully tangy and spicy accompaniment. This last dish was very Thai and not for those with an aversion to offal. Num Ngeow Kanom Jeen is yet another Northern Thai specialty that combines a spicy tomato broth with tender pieces of pork and liver served with Kanom Jeen noodles which are made from fermented rice. David Thompson devotes an entire chapter to these special noodles in his literary culinary masterpiece 'Thai Street Food'. Anyone who has drooled over this book as much as I have will certainly have developed a desire to learn more about these Kanom Jeen noodles. Interestingly Kanom Jeen noodles are traditionally associated with religious rituals and because Thai monks must abstain from eating after midday the noodles have become accepted as a morning meal. 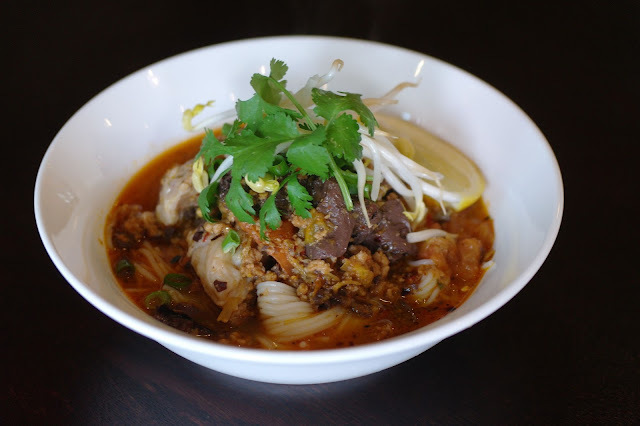 Mmmm offal for breakfast... To see some great photos and learn how Kanom Jeen noodles are made check this great post from Austin Bush. Gluay Ping (Deep Fried Bananas) are a favourite sweet treat for many Thai and one that I'm a bit partial too myself. In Australia we pretty much have two varieties of banana available (Cavendish and Lady Finger) unless you go looking at the asian markets that is. In Thailand there are over 100 varieties of banana available which is incredible really. This link has some fantastic pictures of some of the Thai banana varieties. So if you're into Issan food or just interested in trying some new Thai dishes then I highly recommend checking ZabVers out. 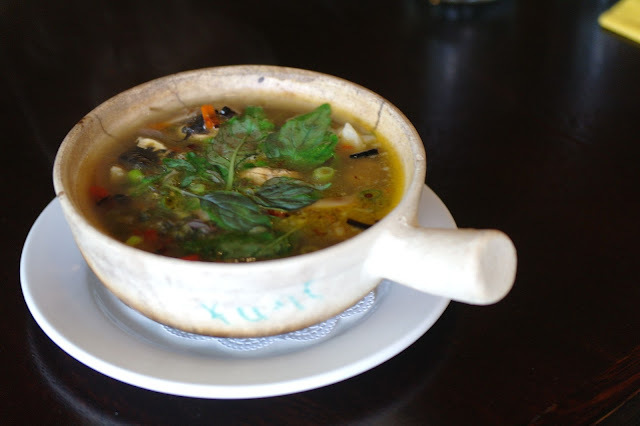 The meals are very reasonable priced and the flavours are authentically Thai. This review was conducted in my capacity as restaurant reviewer for ‘Thailiciouz’. I dined as a guest of the restaurant who knew in advance that I would be dining there, and selected the dishes they wanted to showcase. Please visit the ‘Thailiciouz’ website www.thailiciouz.com.au for information on how you can receive hot deals from various Thai eateries, massage parlours and other contemporary Thai businesses. Hey Krapow, have you checked out Rimthang on Elizabeth/Franklin in the city? A Thai friend directed me to it and they seem to specialize in traditional Thai noodle soups - about 20 varieties of 'em, including boat noodles, khao soi, etc, amongst other goodies. Well worth a look. Howdy H, yes I have been to Rimtang a couple of times and was definitely impressed. My personal favourite was the duck soup with egg noodles. Of course it isn't as amazing as what you get in Bangkok but certainly better than anything I've tried elsewhere in Melbourne. Thanks for the reminder, I will be heading back there soon. This hot weather reminds me of Bangkok and gives me a craving for Boat Noodles! I'm yet to try Rimtang's version but I reckon it will be pretty good.